Our FAQ pages are moving! Please click here to view our most recently updated Frequently Asked Questions. Why should I subscribe to 4for4.com? Each year we have someone email in wondering why we rank all players with the last name beginning with the letter 'A' at the top of his custom cheat sheets. Don't let this be you. Take your time here. If you see odd results, 99.99% of the time it's because you entered bad rules. [So-and-so] is super low in my rankings. What's the deal? Why doesn't Full Impact account for number of DT shutouts, etc? Is it possible to use FULL IMPACT for a league that if your RBs win in total rushing yards, you get all the points for that category? How do I set up Full Impact for my TD only/performance league? Where do I input points for special team TDs? Our league goes a little deeper with the kicker stats. Ex: 0-30 yards = 3pts, 31- 50 Yards= 4pts, 50+=5pts. Where is durability information located? How do I input WR/TE and WR/RB flex options into Full Impact Draft Simulator? Is it possible to set guidelines so that the draft Simulator only selects players that fill the roster requirements? Why does the Draft Simulator take extra QB's and RB's in one of my leagues? How do I configure the Draft Simulator to limit the number of players drafted by position? Why does the Draft Simulator select players earlier than happens in my leagues? What is the difference between a Premium Subscription and a DFS Subscription? Can I get a free 4for4 subscription by depositing at a DFS site? How do I Use the FanDuel Lineup Generator? How do I Use the DraftKings Lineup Generator? What is the Draft Simulator and how does it work? Do you offer cheat sheets for Auction Leagues? How can I generate Top-200 rankings for my keeper league? How do I make a Top 200 Value Based Rankings Report for my league? How do I make a Printer Friendly 1-Page Cheat Sheet for my league? How do the Sortable Draft Rankings & Projections work? How do I Import My Yahoo! League into Draft Analyzer? How do I Import My ESPN League into Draft Analyzer? What is the MFL10 ADP Draft Planner? What is the ADP Draft Day Sleepers Tool? What are the Draft Day Do's and Don'ts? What is the Defense KnowldegeSeeker? What is the Offense KnowledgeSeeker? What are Box Score Forecasts? What is the Target Report? What is the Player Snap App? What is the Fantasy Points Browser? What are 4for4 Hot Spots? What is Schedule Adjusted Fantasy Points Allowed? Question: How do I optimize the 4for4 tools for my league? The 4for4 tool optimization settings allow you to optimize some of our tools for your specific league size, roster requirements and scoring format. While many sites provide pre-canned lists, we take the next step, allowing you to customize our tools for your specific roster requirements. Believe it or not, the value of a WR relative to other positions changes dramatically when your starting roster requires three WRs as opposed to two. The 4for4 tool optimization settings allow for flex representation. Let's say your league starts 2 RB and 2 WR and one flex (WR or RB). Simply change the dropdown roster options to 2.5 RB and 2.5 WR and click go. Now, if you know guys typically start more RBs than WRs at the flex position, then adjust accordingly - example: enter 2.7 RBs and 2.3 WRs. This will only further sharpen your edge! Does your league start 2 RB, 3 WR, 1 TE and 1 RB/WR/TE flex? Try 2.3/3.3/1.3, or if you simply want to focus on RBs and WRs, try 2.5/3.5/1. For some tools, optimization settings also allow you to specify league size and scoring type (STANDARD or PPR). For custom scoring options beyond these, see our Full Impact suite of custom scoring tools. At the end of the day, this is a tool. Make it work for you. Question: Can I email you my fantasy football questions? Unfortunately we can't answer roster questions via email. With the number of subscribers we have it is impossible and counterproductive to spend our days answering specific team questions for all of you. Fortunately, that's exactly why we've built this incredible web site! Also, for those of you who would like someone to discuss your specific scenarios with, we have two scouts on staff dedicated to answering questions like this in the Discuss Your Team forum. Check it out. Simply log in and post your question. Question: Does my 4for4 subscription come with free draft software? Yes! Your 2016 4for4 Subscription includes a license to the Draft Analyzer software with 4for4's award-winning projections and league import/draft sync with Yahoo! (a $30 value). Premium subscribers can also purchase additional in-app add-ons such as league import and draft sync with CBSSports, NFL.com, ESPN, MyFantasyLeague and RTSports for $5 per add-on. DFS Subscribers get unlimited access. Question: Do you project return yardage? 4for4.com does not project return yards across the board. With the turnover at the position and the unpredictability of return yardage from week to week, projecting return yardage stats in general would likely create more noise and hurt your draft. We do maintain Punt & Kick Return Depth Charts throughout draft season. These debut in early August and are updated through the start of the regular season. Question: Do you offer full Rest-of-Season projections during the NFL season? With so much changing week-to-week and even day-to-day in the NFL, and so much minutia involved in Rest-of-Season (ROS) rankings (injuries, matchups, BYE weeks, team situation, etc. ), a full on projection approach would be extremely difficult if not impossible to nail. There is a high likelihood that even the most rigorous forecasting model would end up with a less accurate result using a week-to-week ROS projection approach. Precision in this matter is really not possible. We do publish general ROS Rankings every Tuesday and our customizable Player Trade Evaluator tool. These are intended to be used as guides when analyzing player value for trades, waiver claims, etc. In some situations, players may gain or lose value depending on your specific rules, PPR vs. STD etc. But in general, the ROS rankings represent our opinion on player value moving forward. They are largely open to interpretation and should be used as a guide while taking into account your team needs and specific situation. Question: Do you have the FFPC scoring system available IE. TE 1.5 points per reception? We've gone back and forth on this in the past (different scoring rules for different positions) and at this point we have not enabled this feature. The reasoning is, this is a very uncommon scoring setup, and adding the functionality would exponentially increase scoring rule input for all members. FFPC is the main instance where something like this is used, w/the 1.5PPR for TEs. What most of our members in this situation do is simply have two sets of scoring rules, one for TEs and one for the rest, and then either combine the two, or simply go off of positional cheat sheets when drafting. Another option is Draft Analyzer (Free with your 4for4 subscription). Draft Analyzer does support more complex rule sets like this. Further reading on this subject: How Does 1.5 PPR Scoring for TEs Impact Draft Strategy? Question: What does 4for4 consider standard scoring? Question: What do you mean when you say "verified accuracy"
4for4 is the only web site that proudly displays and monitors fantasy forecast accuracy in a consistent method each and every week. With years of research, experience and results, we've gained a high degree of confidence in our process. We've also won a number of awards in various accuracy contests and boast two of the most accurate experts in the industry. Read more about our accuracy here. Question: Why should I subscribe to 4for4.com? Subscribers have varying needs and we cover all aspects of fantasy football. That said, the #1 thing 4for4 brings to the table are our consistently accurate rankings and predictions -- week after week, year after year. Click here for more details. WAC stand for Weekly Assistant Coach and is an app that analyzes weekly matchups and evaluates trades. Before using WAC, enter your league settings and save your league in the Full Impact hub. Once you have done that, select your league from the "Select League" dropdown menu, which comes with several pre-canned scoring setups which are designated by [fi]. 1) Fill in your likely starting lineup. 2) Fill in your competitor's likely starting lineup. 3) Identify several alternative players (example: available Free Agents or players on your bench), that you think might be worth starting (this step is optional, but suggested). 4) Select the league you are working with (recall Full Impact allows you five different leagues). Using your own league's scoring system, WAC will forecast your starting lineup score and your competitor's score as well. You'll get it straight - regardless of if you're a huge favorite or a major underdog, WAC is going to put it on the line. WAC will offer you some ideas and hints on how you can increase your odds of victory that week. How much risk should you take? WAC will tell you. What tricks of the trade might you want to consider? WAC will give you this type of advice and more. WAC's goal is to make sure you get a "W" that week! And, WAC's advice is all based on your league's scoring rules. At a very minimum, WAC is a big time saver! In addition, WAC will carefully examine the alternative players you have identified. So be sure to enter your best bench players and/or Free Agent options. When WAC reports back findings on your lineup alternatives, it considers a number of factors including how close your game looks, the upside lift you might get from the alternative player and more. WAC Free Agent advice is based on examining over 1500 case studies. Question: [So-and-so] is super low in my rankings. What's the deal? Nearly always when we get a question like this it is due to a misconfiguration of the scoring "ranges." In this example, if a player is projected to have say, 49.5 yards they would fall outside of any range and be awarded 0 points. This causes scoring anomolies for a select few players, depending on their exact projections data. The solution is to update your ranges in the scoring rules for your league to close the gaps in ranges. (eg. 0.000-49.999). Question: How do I use the Value Based Rankings for drafting purposes? Great question. I'll do my best to address the issue. But before I get into that, I'd like to present you with an example. It's completely exaggerated... but it helps illustrate a few key concepts. Be sure to take a few minutes to examine the example and the other material below... it seems like a lot but once we get you on board with this, you'll be all set --- we all want you to win your league! Suppose you had a crystal ball and suppose it's always been perfect at projecting player stats for the coming year. The day before your draft, you decide to ask the Crystal Ball to give you all the player scores. You see all the NFL studs at the top of the list. BUT the #1 guy is your Buddy from high school --- you can't believe it! But, the crystal ball has ALWAYS been right and it gets even more interesting. Your Buddy just went to training camp today --- so hardly anyone even knows his name right now. The Crystal Ball tells you Buddy will play WR and will rewrite the NFL record book this year -- Buddy is going to make 190-receptions, score 38-TDs and rack up 2,700 yards! Remember, the Crystal Ball has never been wrong! The next day, you are sitting at your draft.... THE QUESTION... Where do you draft Buddy? Some might say trade up ASAP and get the #1 pick -- draft BUDDY (it's a no-brainer). Others might say grab a known NFL stud in round #1 and draft Buddy in round #2 or #3. Others might suggest since so few people will be drafting Buddy you should wait until the end of the draft. Others might say, I don't see Buddy on a "Consensus Cheatsheet" so I'm not going to look silly and draft him. And some will even say, I don't like the Crystal Ball's rankings so I'll ignore them. Tick-tock, tick-tock so where would YOU draft Buddy? In my opinion, all three of the "Winner" responses above are valid depending on how you balance risk-reward! The 4for4.com tools can't perfectly mirror YOUR risk-reward tradeoffs. So, only you can answer the question -- "Where do you draft Buddy?" If a TE is ranked very high in the Value Based Rankings, that's letting you know that player is a very valuable starter in your league -- but not saying that you must draft that player very early. Several other major factors come into play (including your own risk tolerance). Our Value Based Rankings help identify the most valuable starters for your league (based on your scoring rules, the number of starters by position and the number of owners in your league). All these factors have an influence on determining how valuable a player is as a starter. To get a good understanding of exactly what VBR does, be sure to see "Baseline Methodology" at the bottom of this page. All that said, "value as a starter" isn't exactly the same thing as where you should draft a player. The missing pieces of the puzzle include where your league mates will likely draft a player and how much you want to risk passing up a valuable starter (because he'll likely go later in the draft). In short, even if a player is valuable, you don't want to overpay for him and draft him "early." Also, keep in mind all your league mates won't have the Value Based Rankings and all these tools! If your rules are very standard (example 1pt for 10 yards rushing or receiving, 6pt TD, etc..), then in addition to VBR I would suggest you work with the "Classic Style" Cheat Sheets and see the Bargains Report and the "Do's and Don't" listing. However, the more your rules vary from "standard", the more I would lean to Full Impact and certainly VBR. If you rules greatly vary from standard performance scoring, I would suggest you work with VBR as your guide and also consider Average Draft Position (ADP) in drafting. You can see ADP data here. Also note... If VBR is rating a player very high, but his ADP isn't that high, you don't need to rank that player as high (as suggested by VBR) in your final draft list. However, moving a very valuable starter down in your rankings does come with risk (but in this case, risk also carries plenty of reward potential). You need to make the call on how to balance the risk-reward ratio. In a nutshell, you want to draft highly ranked players just before they're selected by one of your opponents. In the process, you'll want to target and draft players that give you valuable starts -- a starting lineup that will consistently outscore your opponent's starters. Question: Why doesn't Full Impact account for number of DT shutouts, etc? FULL IMPACT has been built to work with forecasting models that have been PROVEN on thousands of NFL games going back to the early 1990's. Be careful you don't fall into a trap: "the more input options a tool gives you, the more it will help you win!" Other prediction tools may offer input options for the rarest of NFL events and give you a slick interface for all kinds of items. But the truth is, any Preseason Drafting tool that factors in 2pt conversions, 300-yard passing games, defenses pitching a shut out, run the risk of being "precise" --- "precisely wrong." They look good on the surface, but that's not what counts. These tools are playing to a rather gullible audience. Be careful. No NFL analyst worth his salt believes a proven method to model and predict all of the rare NFL events at such a level that it will actually impact player values for a season really exists. A tool that can accurately predict how many games a Team Defense will give up 0-points, 2-5 points, 6-10 points and so on over an entire season (before the season starts) just doesn't exist! I am having a problem entering my league's scoring system into your format. The problem is in one specific area: Rushing, Receiving, Passing Combo. More specifically points 5,6 & 7. For example: 5. Rushing + Receiving + Passing Yards. Then we enter in how many yards equals a point. The problem here is that in my league Rushing, Receiving and Passing yards are weighted differently. For every 16 yards rushing, 1 point is awarded; receiving 21 yds = 1pt. ; passing 49yds. = 1pt. So there is no way for me to enter an accurate number in your system for #'s 5,6 and 7. All of which deal with total yards gained through various ways. I hope you know what I'm talking about and I hope you can offer me a solution. In this case, rather than using the "combined yardage" to grade your players... use the Passing Section, the Rushing Section and the Receiving Section separately. And, just leave the "combo" section alone. This way, you could put in your exact points for each type of yardage. Example: For every 16 yards rushing, 1 point is awarded; receiving 21 yds = 1pt. ; passing 49yds. = 1pt. Also, don't use the range option, use the points per stat field! HINT: Also, you can use the FULL IMPACT tool to do sensitivity analysis. If player-A ranks #8 and player-B is #9, don't assume player-A is ALWAYS the clear pick! If you do "rules sensitivity analysis" and if player-B always stays around #9 while player-A jumps from #5 to #16 you might prefer player-B (assuming your looking for a steady pick). But, if you're looking for a big risk/big reward player, the analysis clearly suggests player-A. Question: Is it possible to use FULL IMPACT for a league that if your RBs win in total rushing yards, you get all the points for that category? Actually, you can closely approximate that system. But, it will take a little math on your part. In turn, you'll certainly be the only person in your league with a really precise handle on exactly how valuable players are for YOUR league. We'll review how you can do this for RB-yards. Be sure to follow the process for the other stats as well. Below, we'll use numbers to keep the math as straight forward as possible. When you apply this, be sure to use the parameters from your league. Lets say you get 100-points for having the best RB-Yards team. Lets say you start 5-RBs and have a 10-team league. First, go back and collect data 8+ weeks from last year (more would be better, less might still be fine). Determine what the average #1 RB-Yardage team generates. #1 RB-Yardage Team averages 350-yards per week. So, if a player can average 70-yards he fits the profile of a winning RB-Yardage team. 70-yds = 100pts/5 = 20 points. In general, the formula is: POINTS / (# Contributing Players on that team). Now, you have benchmarks! 70-yds = 20 points! Next, apply the benchmarks at 20% intervals (20% is a suggested ballpark number). Question: How do I set up Full Impact for my TD only/performance league? The current Full Impact applications do support TD only leagues --- simply fill in the TD fields and leave all the others alone. Then run the apps. The result will be rankings for TDs only (example 6pts = 1 TD). Question: Where do I input points for special team TDs? Keep in mind Full Impact Cheat Sheets use projected data (not data recorded after the fact like commish scoring systems). So, Full Impact will not have all the scoring features as a Commish scoring system. This is by design. Special teams TDs falls into the same category as "2-pt conversions" (see above). Question: Our league goes a little deeper with the kicker stats. Ex: 0-30 yards = 3pts, 31- 50 Yards= 4pts, 50+=5pts. In this case you could put 3.5pts per FG and put 2 pts for the (extra) long distance bonus. That will very closely approximate your system. Question: What are "Combo Stats"? Some leagues ADD Rushing and Receiving Yards together then score out the performance. For those leagues you can use the combo section (example REC+RUSH YDS). Question: What is the best way to fill out scoring ranges? Some projected statistics are integers, some are decimals. The safest way to complete your scoring ranges is to insure no gaps exist between the ranges. Question: Where is durability information located? On the Simulator report page for the draft it mentioned the need to draft more durable players; I just signed up for your service & did not see where such information is available in a summary form. Can you tell me? Please see our Rankings with Sortable Projections for player health grades. In our league a player gets 1 point for each 10 yards rushing, 2 points for each 25 yards receiving, 2 bonus points for 100 yards receiving and rushing combined, and 1 additional bonus point for 150 receiving and rushing yards combined. How do I represent this in your rules? Full Impact can nail this 100%. This will give you custom analysis for your league. You'll have an advantage each week of the season. Question: How do I input WR/TE and WR/RB flex options into Full Impact Draft Simulator? For your starting roster requirements of QB, RB, RB, WR, WR, TE, WR/TE, WR/RB, K, DEF, try: 1-QB, 2.5-RB, 3-WR, 1.5-TE etc... The simulator allows for fractional averages. Question: Is it possible to set guidelines so that the draft Simulator only selects players that fill the roster requirements? I tried your draft simulator and found that during the draft more positions were drafted than what was allowed per team roster. Our league roster allows 2 QB; 4 RB; 4 WR; 2 TE; 2 K; 2 Def. When the draft was over some teams had 5 QB's and 1 TE or were over in some positions and short at others. Is it possible to set guidelines so that the draft only selects players that fill the roster requirements set by your league? The Draft Simulator is actually considering your target number of starters. But in the later rounds, it goes after the best value picks (so for example it often passes over a kicker to get a decent backup QB, etc...). So if you have 1-QB starter, it is possible the Simulator may draft two or more (and avoid a dime-a-dozen kicker). Right now, Simulator does not allow for: 'you must pick X-number and can not go over Y-picks, by position). Keep in mind the Simulator Report Card really focuses on your starting lineup, so as you try the tool and experiment, keep focused on your team scores from simulation to simulation (the last few picks rarely disrupt that portion of the exercise). Question: Why does the Draft Simulator take extra QB's and RB's in one of my leagues? When in "Computer Strategy Mode" the Simulator looks for value and it considers your starting lineup needs. The heavy-up on QB and RB is suggesting something to you. Also, try experimenting with your Simulator inputs, even if they don't 100% match your league. The idea being we want you prepared for all kinds of situations during your LIVE draft. That way, while the others are forced to be thinking on their feet, you'll have plenty of experience and it will be automatic. The Simulator might be loading up on QBs and RBs because it sees the most value in those spots. If you really don't like that, tell Simulator you require more starters at WR and TE (even if that's not 100% true). By doing this, you can train the Simulator to do what you want. But, be careful... again we want you prepared for anything that comes your way on Draft Day. Finally, try the Simulator in "ADP Mode" too. Question: How do I configure the Draft Simulator to limit the number of players drafted by position? You control the number of starters based on your inputs upfront at the beginning of the process. But, the system does not limit the number of players that can be drafted for a given position. This is by design. Question: Why does the Draft Simulator select players earlier than happens in my leagues? Understand your comments 100%. Try the Simulator in "ADP Mode." Keep in mind when the Simulator is in "Computer Strategy Mode" the goal is to have you drafting the best team possible (not to mirror the exact nature of what your league may or may not be doing). So, does your score keep getting better each time you use the Simulator? Do you beat the Simulator or is it the other way around? Again the focus is what you are doing to draft the best team possible. The Simulator looks for value and it considers your starting lineup needs. Perhaps the Simulator going after a WR in the 4th round is suggesting something about your league and how to draft. The goal is not to have the Simulator draft like you want, your goal is to draft the best team. Finally, for example, the Simulator might be loading up on WRs or RBs because it finds the most value in those spots. If you really don't like that, tell the Simulator you require more starters at QB and TE (even if that's not 100% true). By doing this, you can train the Simulator to do what you want. But, be careful... again we want you prepared for ANYTHING that comes your way on Draft Day. We want you understanding the trade-offs of going RB-RB or QB-WR etc... And we don't want you thinking on the fly (like the guy next to you). If you spend time with the current Simulator and study results you'll be learning the trade-offs. Question: I am using ranges, why is the "Yards per point" radio button is checked? My league uses ranges for scoring for passing, rushing, and receiving. I save my league with "Use Ranges" radio button checked. When I go back to look at what I have entered the "Yards per point" radio button is checked. You can ignore the "radio button" that comes back. The location of the radio button has no influence on the actual player scores. As long as you can retrieve your league's rules from the Full Impact data entry screen (and they look good) that's all that counts. Question: In an autodraft, should I use the Value Based Rankings list as my predraft list? Unfortunately, we won't be having a live draft, instead, we will select draft picks by creating a predraft list and let the computer actually run the draft for us. The computer picks all starting positions first in order from the predraft list then fills up the bench with 6 people. Would you suggest using the Value Based Rankings list generated by 4for4 for my league rules as my predraft list? We suggest you work with the Value Based Rankings as your guide and also consider Average Draft Position (ADP) in submitting your final rankings. EX: If the VBR app is rating a player very high, but his ADP isn't that high, you don't need to rank that player as high in your final list. However, moving a very valuable starter down in your rankings does come with risk (still that risk brings plenty of reward potential). Putting together a well-designed draft strategy, having a backup plan, anticipating your competitor's moves and identifying bargains in each round is a lot of work. But, if you really want to win, it's essential. You want to draft highly ranked players just before they're selected by one of your opponents. In the process, you'll want to target and draft players that give you valuable starts -- a starting lineup that will consistently outscore your opponent's starters. Question: How do I configure Full Impact to account for my bonuses? My league has a bonus for 100+ yards rushing or receiving and a bonus for 300+ yards passing. Is there anyway to incorporate this into Full Impact? An important concept to keep in mind is that Full Impact uses projected data (not data recorded after the fact like commish scoring systems). Huge difference! So, Full Impact will not have all the scoring features of your league. This is by design, because you are working with forecast data. What we want to do is approximate the increased value a bonus gives to a stat. Brees would get 3 bonus points and Ryan 0. However, this would be an incorrect approach. We are not predicting Drew Brees to pass for exactly 301 yards in every game; nor Matt Ryan to just miss the 300 yard mark in every game. Our projections indicate that both have around a 50% chance of hitting 300 passing yards in a given week. The best way to account for the increased value a bonus gives is to increase the value of the stat. For all intents and purposes, the more of a certain stat (eg. PaYds) a player accumulates, the more likely they are to hit a cumulative bonus. You can slightly weight your league towards a stat to approximate the value of a bonus. If you prefer to go this route, something like 19.5 or 19 passing yards per point (as opposed to 20) can approximate a small passing yardage bonus (1-3pts). For rushing and receiving, setting rushing yards to 9.5 or 9.75 yards per point (as opposed to 10) can approximate a small yardage bonus. Don’t build the full value of the bonus into the yardage, because most bonuses are relatively rare occurrences. We should not overestimate the impact a small, or rarely hit bonus makes. Unless they are significant, it is generally best to simply leave bonuses out of your scoring rules at 100 yards or more for rushing/receiving and 300 yards or more for passing. It's relatively rare that players hit these bonuses, and factoring them in on draft day will rarely contribute a positive result. Your goal should be to draft the best players and let the bonuses sort themselves out. Question: How can I print the Full Impact reports for my draft? From the Full Impact Hub page, simply select Customized 1-Page Printer Friendly Cheat Sheets. Question: Why are some Ks, TEs and DTs so high in the Value Based Rankings? I've entered my league scoring on the Full Impact page and I'm wondering why when I run the Value Based Rankings it has a handful of kickers, tight ends and defenses in the top 50 players on my x-factor sheet? There is no way I would draft a defense, kicker or TE within the first 50 selections. Also after 50 positions or so, the x-value goes negative. Why? The report is not necessarily saying who to draft first. Value Based Rankings are not necesarily a drafting order list. Value Based Rankings shows the most valuable starters based on your inputs. The key word here is starters. So, lets say your league has 14 teams and you guys start 2-RBs each. If that's the case, the 29th RB has little value as a "starter" (but sure he's more important than many kickers). Finally, if you want Value Based Rankings to rank more RBs early, just add 1.0 or 1.5 to the RB starter requirement and that will do it for you. Question: I am using ranges, but some of the players in my cheat sheets are showing up much lower than they should. What is going on? will result in a gap between 49 and 50 yards. If a player is projected to rush for 49.5 yards, they will not be accounted for and will be awarded zero points -- not your desired outcome. Question: I'm not sure how to use Full Impact for my rules. In my league we award points based on the exact distance of a TD. For example: if a RB runs in a TD from 5-yards out, I get 6 points. But if the TD is run in from 10-20 yards away I get 10 points. You use a distance scoring system. While it is very easy to grade out a player's points after the game, predicting his score before hand is completely different. Keep in mind Full Impact works with forecast data, not post-game stats (like a league commish service). That's a huge difference. In order for Full Impact to perfectly mirror all possible distance scoring systems out there, it would require forecasting the number of TD scores from 1-yd out, 2-yds out, 3-yds out all the way to 100-yds out for every skill position NFL player. In addition, it would require this every week during the season and in the preseason as well. Frankly, that's just not practical and even more important, it wouldn't be highly accurate and could lead to poor results. Nobody can accurately predict how many 42-yd TDs Manning will have vs. 43-yds TDs vs. 50-yds TDs etc. If someone tells you they can, run in the other direction. Still, all is not lost - in fact, far from it! Full Impact can address long-distance TD scoring. Here's how. First we need to establish an NFL baseline for Passing TDs and Rushing TDs. The charts below do this for us and they are based on years of NFL game data. From the chart you can see that 77% of all rushing TDs are 0-9 yard runs. And, 10-20 and 21+ yard TD runs occur about the same percent of the time - 10% and 13% respectively. This will very closely mirror your system and will provide you with a robust solution for rushing TD distance points. Likewise, follow the same process for Pass/Rec TDs. Using this method will give you a competitive advantage over your rivals and that's the name of the game. Question: How do I erase a league? I want to get rid of two that I've entered? Go to the Full Impact data entry page. Select the league you want to delete. Then, click delete league. Question: Can Full Impact allow for flex players? Yes. Full Impact is flex position friendly. Let's say your league starts 2-RB and 2-WR and one flex (WR or RB). Just tell Full Impact you start 2.5-RB and 2.5-WR. Now, if you know guys typically start more RBs than WR at the flex position, then adjust accordingly - example: enter 2.8-RB and 2.2 WR. This will only further sharpen your edge! Question: Can I use 4for4's projections in another lineup optimizer? Yes, if you're looking for different features than what we offer in our lineup generator, check out our friends at LineupLab. They are an advanced NFL, NBA, and MLB lineup optimizer for FanDuel and DraftKings. LineupLab’s proprietary algorithm can sort through trillions of possible lineups in seconds to provide the top overall lineups for any sport. Question: What is Daily Fantasy Sports / DFS / FanDuel / DraftKings? You may have seen the advertisements for FanDuel and DraftKings and are wondering, what exactly is this new type of fantasy football? Daily Fantasy Sports (DFS) contests are a new, exciting way to put your fantasy football knowledge and 4for4 Subscription to use. While the majority of fantasy leagues draft in August and run through the season, DFS contests are generally one week games where you pick a lineup of priced players within the constraints of a salary cap. Your lineup then competes against one to hundreds of thousands of other lineups depending on the game type you enter. Question: How should I get started playing DFS? First, you’ll need to open an account at a DFS site of your choosing and make an initial deposit. FanDuel and DraftKings have the most players and the biggest payouts, but some 4for4 Subscribers prefer to play on smaller sites like FantasyAces, FantasyFeud, DraftDay, OwnThePlay and Yahoo! for various reasons, including promotions, roster configuration, competition level, etc. If you want to take some risks for a huge payday, go ahead and play large-field tournaments. If you are looking to more consistently turn a profit and grind up your bankroll, consider starting with low buy-in head-to-head games. We highly recommend new players read the Daily Fantasy Playbook as a starting point. In the book is a Quickstart Guide to DFS along with The Head-to-Head Bankroll Growth Blueprint, everything you need (along with a 4for4 Subscription) to start winning on FanDuel, DraftKings or wherever you decide to play. Question: Is DFS / FanDuel / DraftKings legal? In some states (here's a comprehensive breakdown from LegalSportsReport) DFS is against state law. More often than not when you take a closer look, you will find this is not due to some sort of moral stance against fantasy football, but rather to protect one competing interest or another. Question: Is Daily Fantasy Sports (DFS) gambling? This is a hotly debated question at this moment in Daily Fantasy Sports (DFS) history, sparking much debate. The answer comes down to your definition of gambling. Despite many framing the debate in this way, the "is it gambling" question is the wrong question to be asking. There are numerous examples of activities that fit the textbook definition of gambling above that are accepted and legal in the United State of America. Daily Fantasy Sports is one of them. The term “gambling” is a highly stigmatized word and comes with much baggage attached to it. But regardless of your definition, it is clear DFS is legal federally under current US law written specifically for fantasy sports. The way I like to think about the question is, can a skilled player expect to turn a profit over time? Or to put it another way, can it be a good investment? In rigged games like craps, slot machines, the lottery etc, the player is certain to go broke given a long enough time frame. Strategy can sometimes be optimized, but no winning strategy exists. The house always wins. End of story. But, in games of skill like DFS that put player against player, skilled players can and do become long-term winners. If a head-to-head DFS player has the skill to win 56% or more of his matchups against other players, he can expect to have a positive ROI over time. In this scenario, DFS can be a good bet, and can be viewed as a positive investment. Of course, many players can and do lose money. As always, please play responsibly and never deposit more than you can afford to lose. But, one of our primary directives here at 4for4 Fantasy Football is to give you projections, tools and content to empower you to become a better and more profitable fantasy football player. Question: What is the difference between a Premium Subscription and a DFS Subscription? For a detailed, side-by-side comparison of our Premium and DFS Subscription Plans, please click here. 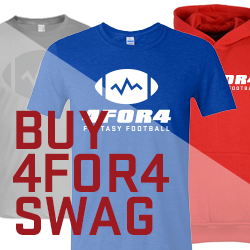 Question: Can I get a free 4for4 subscription by depositing at a DFS site? We have partnered several of the top Daily Fantasy sites in the world to bring you an easy way to claim a free, no-strings-attached DFS subscription to 4for4 Fantasy Football for the current season. Click here for more details. Question: How do I Use the FanDuel Lineup Generator? To get started with the FanDuel Lineup Generator, simply select a group of players at each position that you are considering for your lineups or just click "OPTIMIZE". Try the FanDuel Lineup Generator now!!! Watch as 4for4 expert TJ Hernandez teaches you how to use the FanDuel Lineup Generator. You can also read more about the tool below. One of the most exciting and useful elements of the FanDuel Lineup Generator is the ability to optimize a team using any of 4for4's projection models: standard, ceiling or floor. Without even choosing a player pool, the optimize function will give you the highest possible projected team based on 4for4's award-winning projections. Taken a step further, the FanDuel Lineup Generator gives you the option to lock in your favorite players and optimize a team around those selections. While the optimizer does produce fantastic lineups, we would not recommend blindly plugging in a lineup into a DFS contest. Rather, the optimize function is a great tool to help recognize value that you may have overlooked otherwise and include those value plays in your player pool, which can include up to 50 individual players and will generate the top 50 projected lineups. In addition to selecting individual players for your player pool, the FanDuel Lineup generator includes filters for fantasy point projections, salary, Vegas lines, home and away, or even entire teams. Question: How do I Use the DraftKings Lineup Generator? To get started with the DraftKings Lineup Generator, simply select a group of players at each position that you are considering for your lineups or just click "OPTIMIZE". Try the DraftKings Lineup Generator now!!! Watch as 4for4 expert TJ Hernandez teaches you how to use the DraftKings Lineup Generator. You can also read more about the tool below. One of the most exciting and useful elements of the DraftKings Lineup Generator is the ability to optimize a team using any of 4for4's projection models: standard, ceiling or floor. Without even choosing a player pool, the optimize function will give you the highest possible projected team based on 4for4's award-winning projections. Taken a step further, the DraftKings Lineup Generator gives you the option to lock in your favorite players and optimize a team around those selections. In addition to selecting individual players for your player pool, the DraftKings Lineup generator includes filters for fantasy point projections, salary, Vegas lines, home and away, or even entire teams. Finally, you can save any lineup directly into the DraftKings Lineup Generator to come back to later or export up to 500 lineups into a CSV file to be easily uploaded to DraftKings. Question: What is Auction Analyzer? Auction Analyzer is the most powerful draft software available, offering personalized auction advice updated after every pick based on 4for4's award-winning projections and Auction Analyzer's customized auction values. Watch as 4for4 expert TJ Hernandez teaches you how to use Auction Analyzer. You can also read more about the tool below. Once you import a league into Auction Analyzer, you can immediately begin to use Auction Analyzer's, which is powered by 4for4's award-winning projections. On the day of your draft, Auction Analyzer does all the heavy lifting for you. Each draft pick is automatically imported from your online draft into the Auction Analyzer software and Auction Analyzer dynamically optimizes your draft and optimal roster with every pick. Question: How do I use the Trade Analyzer/Lineup Grader? Before using the Trade Analyzer/Lineup Grader, enter your league settings and save your league in the Full Impact hub. Once you have done that, select your league from the "Select League" dropdown menu, which comes with several pre-canned scoring setups which are designated by [fi]. The "Weekly Assistant Coach" or WAC is a Full Impact tool designed to help you each week of the NFL season. During the season, WAC is loaded with 4for4.com's weekly projected player forecast data. In turn, using your own league's scoring system, WAC will forecast your starting lineup score and your competitor's score. WAC tells you if you're a favorite or an underdog that week and it offers you some ideas and hints on how you can increase your odds of victory. Question: What is the Draft Simulator and how does it work? The Draft Simulator is a mock draft tool that enables you to pick a team using your league's rules and quickly allows you to see what strategies seems to grade out best after the draft is over. Watch as 4for4 expert TJ Hernandez teaches you how to use the Draft Simulator. You can also read more about the tool below. Try the Draft Simulator now!!! Customized for the league of your choice with your draft pick and optimal roster settings, the Draft Simulator takes you through a realistic draft and will analyze your roster in terms of Injury Risk, Playmaking Ability and more. To get started with the Draft Simulator, enter your league settings and save your league in the Full Impact hub. Once you have done that, use the configurator to select your league from the "Choose your league" dropdown menu, which comes with several pre-canned scoring setups which are designated by [fi]. Finally, enter a drafting method for the computer, the number of rounds and teams in your draft, your draft positions, and the usual numbers of starters per team (If your league starts 2 RBs, 2 WRs and a flex, but you'd like to tilt your flex towards the RB position, enter 2.7 and 2.3 for RB and WR, respectively). You can also select any players that you would like to exclude from the draft. After entering all setting, you will be taken to the draft interface where you can mock in just minutes! You'll be presented with a handy cheat sheet at the bottom of the draft page. Players are graded out using your league's scoring system (how cool is that?). From the cheat sheet, you simply click on the player you want to draft. The Draft Simulator does the rest. The Draft Simulator displays the round and it removes players from the cheat sheet once that player or team has been selected. When the draft is over, the Draft Simulator will let you know the draft is over. Next, it's time to grade everyone out! You'll see how you did and you'll see how the computer teams made out as well. In addition, the Draft Simulator will analyze your roster in terms of Injury Risk, Playmaking Ability and more. Regardless of how you did relative to the computer, the output section is your time to look and learn! Why did some teams do well? Why did some teams struggle? Don't rush past the output page – here's where you can really determine what strategy seems to be working and what looks ill-advised. Be sure to study the outputs and learn what draft strategies give you an edge. The purpose of this application is not to mirror exactly what you think will happen during your draft, but more so, it allows you to see what strategies seems to grade out best after the draft is over. Try the Draft Simulator over and over again. Practice makes perfect. If you want to dominate your draft, you'll need to understand all the draft dynamics and the consequences of making your picks. If you are serious, you'll need to know this in your sleep. That way, when you're going live, you'll have a HUGE advantage over your competitors! Interestingly, rarely will the Draft Simulator play out the same way twice. And, if you vary your input parameters, you'll learn that much more. Try drafting in a small league. Try a large league. And be sure to experiment with starting lineup requirements. Have you ever wondered what would happen if you tried a really bold drafting strategy in your league? Five minutes with the Draft Simulator and you'll have your answer. Like all our Full Impact tools, results are tailored to your league's rules. TIP: If you want the Draft Simulator to draft more RBs (for example) earlier in your draft then, before the draft starts, on the input screen, increase the RB count (example: instead of RB=2.0, tell it RB=3.0). If you want the Simulator to draft fewer RBs early on, during your inputs session right before the Simulation starts, simply lower the RB count (example instead of RB=2.0, tell it RB=1.33). By adjusting the inputs, you can get the Simulator to reflect your thinking. By alternating the inputs the tool will draft almost any way you like. Question: Do you offer cheat sheets for Auction Leagues? Watch as 4for4 expert TJ Hernandez teaches you how to use the Auction Cheat Sheet. You can also read more about the tool below. Try Auction Cheat Sheet now!!! To get started generating your customized Auction Cheat Sheet, enter your league settings and save your league in the Full Impact hub. Once you have done that, use the configurator to tell us how many teams are in your league and select your league from the "Choose your league" dropdown menu, which comes with several pre-canned scoring setups which are designated by [fi]. Finally, enter your bank size as well as the percentage of your bank that you would like to spend on your starters (for more information on Starters Spend % and position inputs, read ahead). The application will give you the Maximum Suggested Bid ($) for every available player, tailored for your specific league settings. Note: The bid values are not what 4for4.com suggests you actually spend, as you always want to spend as little as possible on a given player. For bankroll, we recommend you spend 90% on your starters, and 10% on reserves. This is a fairly aggressive strategy -- if you want a deeper roster, try 85% or 80% instead. You will have to sacrifice some quality in your starting lineup, however. Your position numbers need not be your starting lineup requirement. Example #1: You may only start two RBs in your league, however you may want your core roster to contain three stud RBs and you're willing to bid that way. If so, enter 3 for RBs (not 2). Example #2: You may start one TE in your league, but don't want to focus your bidding on a TE. In this case, enter 0.5 for TE (not 1). Example #3: If your league starts 2 RBs, 2 WRs and a flex, but you'd like to tilt your flex towards the RB position, enter 2.7 and 2.3 for RB and WR, respectively. If you're not sure how to balance your team and focus your roster, enter values that most closely approximate your league's typical starting lineup. The default methodology will work for just about any league setup. Feel free to experiment with several options and find the one that fits your overall team management philosophy. Kickers: Let someone else overpay for a kicker. Your goal should be to get a good kicker with a minimum bid. One trick is to nominate a kicker in the #5-#10 range your minimum bid early in the draft. You'll often win the auction as other fantasy owners are focused on other positions. Defense: Expect to pay 1%-1.5% of your bankroll on an elite DT. If you are comfortable with using the waiver wire to change your defenses week to week, look for a mediocre defense with good matchups early in the season and spend no more than $1. Question: How can I generate Top-200 rankings for my keeper league? The Top 200 Keeper Rankings assigns player values which account for your league's starting lineup requirements and scoring system. Try Top 200 Keeper Rankings now!! Watch as 4for4 expert TJ Hernandez illustrates how to customize your Top 200 Keeper Rankings. You can also read more about the Top 200 Keeper Rankings below. To get started generating your customized Top 200 Keeper Rankings Report, enter your league settings and save your league in the Full Impact hub. Once you have done that, use the configurator on the rankings page to tell us how many teams are in your league and select your league from the "Choose your league" dropdown menu, which comes with several pre-canned scoring setups which are designated by [fi]. Enter a Current Year Weight (1-100). The more weight you assign to this year, the less the system will value future seasons. (Read on for more information on selecting your Year Weight). Also, tell us what you consider to be your ideal core roster. This can be your starting lineup requirement or some variation as you see fit. Example: you may only start one QB but feel your core roster needs two. The Top 200 Keeper Rankings will be generated after you submit these settings and will include overall ranking, positional ranking, and each player's age. This report is sortable by each category and is easily exported to a CSV file for easy customization and use as an on the go rankings report. How to Pick the "Current Year Weight"
While a value of 75 provides a reasonable way to balance current vs. future team needs, as the team owner, it's up to you elect how to balance short and long-term success when managing your keeper roster. Experiment with several weights and find the one that fits your management philosophy. Keeper league cheat sheets are a mixed bag. Good keeper rankings must carefully blend Art and Science. In addition, they should aid your roster management strategy. Before we dive into the rankings, I'd like to provide some context and offer up a few facts. The scouting process is at the core of all NFL roster management. And frankly, scouting and evaluating NFL talent is often very subjective. A number of different factors go into grading a player's ability. For quarterbacks, arm strength, field vision, pocket awareness and throwing accuracy must be considered. For wide receivers, the ability to run designed routes, release from the line, block downfield, and gain yards after the catch are all analyzed. Objective measures are routinely documented at the combine. These include 20- and 40-yard dash times, vertical and broad jump distances, 20-yard shuttle speed and 225lb. bench press count totals. Reviewing the data is the easy part. However, among athletes possessing the required physical skill, success is often determined based on one's mental game. Unfortunately, that's not so easily measured. When it comes to fantasy football, at 4for4, we leverage player durability, consistency and estimated workload data. We combine this analysis and consider each team's offensive scheme and how each player graded out in the previous season. However, for keeper league rankings, that's only part of the puzzle. For keeper leagues, much like real NFL scouting, a number of intangibles (including a player's mental game) must be considered. We've all seen NFL players fade into the sunset after landing a million-dollar deal. Does the player really have a "fire in his belly?" How will he react to a coaching change? NFL football is a harsh reality. Hesitation, lack of focus and playing with partial motivation all spell trouble. And so, subjective factors come into the keeper league ranking process -- it's what we call the Art. Typical Player Lifecycle. Getting a read on how most players increase, peak and decline over time is absolutely essential. Player Position. As you will soon see, standard NFL performance varies greatly by position over time. Individual Peak. The age a given player hits his prime contributes to determining his future value. Health. Historical injury status and current player health clearly correlate with NFL longevity. College Accomplishment. The round a player was drafted into the NFL factors into the equation. Statistical analysis using years of actual player data has resulted in a library of player lifecycle curves. While not perfect, this normative data is very helpful in projecting a number of NFL career paths. Combining this analysis with other relevant information helps establish best case trends. This helps us project a player's value over a number of years. Below, you'll find a few essentials based on years of actual data. QB: Less than 15% of all quarterbacks peak before the age of 25. In fact, almost 35% of all QBs have their best statistical season after their 30th birthday. History suggests if a QB can put up decent numbers while in his mid-twenties, things will only get better. The data shows most top-tier QBs reach their prime between 27 and 33. Over a three-year planning horizon, advanced age generally isn't that much of a factor in projecting fantasy point decline, unless the QB has already reached age 36. RB: Unlike quarterbacks, most running backs typically reach their prime between 23 and 26 years of age. In addition, less than 5% of all running backs peak after age 30. In fact, once they reach 30, a number of running backs have trouble finding work. If they do, on average, their output is typically 1/3 the statistical level achieved in the prime of their career. Certainly there are expectations. However, the odds really do work against the 30+ year-old RB. WR and TE: Overall, wide receivers and tight ends tend to reach their peak in their mid-twenties. WRs generally have their best single season performance between 25 to 28. However, in general, receivers tend to decline over time slowly. In fact, the average starting 30 year-old WR tends to be almost as productive as the typical starting 25 year-old. However, on average, productivity greatly declines once a receiver hits the age of 33. To get the most from your 4for4 keeper rankings, you'll need to do some work. In addition to studying the ratings, you'll need to think about your own unique situation, adapt accordingly and exercise good judgment come draft day. Like an NFL GM, you'll need to address a few philosophical issues. You'll need to come to grips with balancing short- and long-term success. Should you aggressively seek out a roster of aging studs to win now at the risk of running your team into the ground in 2-3 years? Or, should you sacrifice a few wins in the short-term in an attempt to build a true dynasty in 2-4 years? Clearly a number of variables come into the mix and no one strategy or philosophy can cover all fantasy football situations. Clearly, "proper strategy" is a function of your league format -- so know your rules! However, I don't think your going to let me off the hook quite that easily! Personally, I've seen both extremes work to varying degrees. Actually, if you think about it, all keeper league rankings must address current vs. future value. I'd like to share an insight based on how several NFL organizations have balanced the need to win now with the need to remain competitive down the road. This philosophy is actually very similar to the one built into the 4for4 keeper rankings. As far as I know, former Dallas Head Coach Jimmy Johnson was the first person to champion the logic. In fact, Jimmy often applied this "rule of thumb" while wheeling and dealing during the NFL draft. The thinking is rather straightforward and goes something like this: a 4th-round draft pick this year has about the same value as a 3rd-round pick selected next season. Likewise a 4th-round pick this year has the same value as a 2nd-round pick in two years. Finally, a 4th-round pick this year is essentially worth a 1st-round pick in four years. In general, delaying a draft pick one year, equates to moving up about 30 spots next year. Loosely translated to fantasy football, Jimmy's philosophy suggests you value upcoming player accomplishment as follows: Y (x1.0), Y+1 (x.50), Y+2 (x.25), Y+3 (x.12), Y+4 (x.06) and Y+5 (x.03). Question: How do I make a Top 200 Value Based Rankings Report for my league? The Top 200 Value Based Rankings assigns player values which account for your league's starting lineup requirements and scoring system. Try Top 200 Value Based Rankings now!! Watch as 4for4 expert TJ Hernandez illustrates how to customize your Top 200 Value Based Rankings. You can also read more about the Top 200 Value Based Rankings below. To get started generating your customized Top 200 Value Based Rankings Report, enter your league settings and save your league in the Full Impact hub. Once you have done that, tell us how many teams are in your league and how many starters you use by position. Entering your specifics takes about 15-seconds. As you'll soon see, these variables are absolutely essential in helping you determine the most valuable fantasy players in your league. That's why canned Top-100 lists often just don't cut it. The Top 200 Value Based Rankings Report is sortable by each category and is easily exported to a CSV file for easy customization and use as an on the go rankings report that you won't get with a generic Top-100 list! Which player has the most value? Of the eight players, QB1 scores the most points, but that does not make him the most valuable. Remember, the idea is to outscore your opponent at each position, so relative value is more important. In order to determine relative value, we find the difference between the two players at each position. The second player in each equation is the baseline for that position. From this, we can assign a score to each player: TE1 (8), RB1 (5), QB1 (3), WR1 (2). The most valuable player in the draft is TE1 because he gives you the greatest advantage (+8) over your opponent. The next player on your draft list should be RB1, followed by QB1 and WR1. VBR is essentially the same process on a much larger scale. It takes your customized league settings (i.e. scoring system, starter requirements) and generates customized baselines to determine relative value. Traditional value rankings use "worst starter" or "average starter" methodology, but due to position scarcity, most fantasy owners covet RBs (and to a lesser extent, WRs) more than the other positions. To account for this, we calculate baselines using "core roster" methodology. Your core roster is simply your starting skill position players, with any flexes being split among the positions. Alternatively, you can tweak your core roster requirements to better fit your league's draft tendencies. The Value Based Rankings Application then calculates baseline scores at each position and presents you with a list of players, ranked by relative value. Question: How do I make a Printer Friendly 1-Page Cheat Sheet for my league? The Printer-Friendly 1-Page Cheat Sheet is a compact, printer-friendly cheat sheet that shows average projected scoring for your specific league. Try the Printer-Friendly 1-Page Cheat Sheet now!! Watch as 4for4 expert TJ Hernandez illustrates how to customize your Printer-Friendly 1-Page Cheat Sheet. You can also read more about the Printer-Friendly 1-Page Cheat Sheet below. 4for4 allows you to generate a compact, printer-friendly cheat sheet that shows average projected scoring for your specific league. Once you’ve saved your league in the Full Impact hub, you will see that league available in the dropdown menu on the cheat sheet setup page along with several pre-canned scoring setups which are designated by [fi]. To get started simply input the maximum number of players that you would like displayed at each position. From there you will get a cheat sheet that shows each position on a single page and includes positional rankings, player names, bye weeks, and projected fantasy points for your specific league based on 4ffor4's award-winning projections. This guide is especially useful for breaking up players into tiers based on projected scoring and as a quick reference guide in your live drafts. The Printer-Friendly 1-Page Cheat Sheet is available in a rookie-only version for your dynasty rookie drafts, too!! Question: How do the Sortable Draft Rankings & Projections work? Sortable Rankings and Projections offer a positional breakdown of rankings, projected stats, and corresponding fantasy points based on your individual league settings. Use the Sortable Rankings and Projections now!! Watch as 4for4 expert TJ Hernandez illustrates how to customize rankings and projections for your specific league settings. You can also read more about the Sortable Rankings and Projections below. Once you’ve saved your league in the Full Impact hub, you will see that league available in the dropdown menu on the rankings page along with several pre-canned scoring setups which are designated by [fi]. After selecting your league from the dropdown, 4for4’s award winning projections will be used to generate a report that includes all relevant stats and fantasy rankings for every position, optimized for your specific league size, roster requirements and scoring format. These rankings can be easily exported into a CSV format that can be used as a detailed positional cheat sheet on draft day. Question: How do I Import My Yahoo! League into Draft Analyzer? In order to import your Yahoo! Sports fantasy football league into Draft Analyzer, you must find your League ID within the league URL. Watch as 4for4 expert TJ Hernandez teaches you how to import your Yahoo! Sports fantasy football league into Draft Analyzer. You can also read more about Draft Analyzer below. Question: How do I Import My CBS League into Draft Analyzer? Question: How do I Import My ESPN League into Draft Analyzer? In order to import your ESPN Sports fantasy football league into Draft Analyzer, you must find your League ID within the league URL. Watch as 4for4 expert TJ Hernandez teaches you how to import your ESPN Sports fantasy football league into Draft Analyzer. You can also read more about Draft Analyzer below. Question: What is Draft Analyzer? Draft Analyzer is the most powerful draft software available, offering personalized draft advice updated after every pick based on 4for4's award-winning projections. Watch as 4for4 expert TJ Hernandez teaches you how to use Draft Analyzer. You can also read more about the tool below. Question: What is the MFL10 ADP Draft Planner? The MFL10 ADP Draft Planner integrates actual MFL10 draft data from MyFantasyLeague to provide up-to-date availability for players at any point in the draft. Try the MFL10 ADP Draft Planner now!! Watch as 4for4 expert TJ Hernandez teaches you how to use the MFL10 ADP Draft Planner. You can also read more about the tool below. By selecting a specific round and draft pick, along with up to five players at their current ADP, the planner will provide historical MFL10 availability of each individual player along with the availability of "at least one" in the group. Since positional availability is often interdependent (i.e. if Player A is not available, Player B is more likely to be there), having access to this actual availability is invaluable when sketching out a draft plan. The point of the MFL10 ADP Draft Planner is to provide you with concrete numbers on how confident you can be about a player's’ availability at your given draft slot. Instead of waiting until you are on the clock to make roster decisions, you can plan rounds ahead of time for your target players. Imagine that two of your favorite targets in the draft are Russell Wilson and Frank Gore. You have the fourth pick in the seventh round, which is right about where both players are being drafted, on average. If you put your pick into the Draft Planner and select Wilson and Gore, you will see that there is a 47 percent chance that Wilson will be available at 7.04, but just a 38 percent chance that Gore will fall. Since ADP is just an average, the Draft Planner shows us that Wilson’s ADP tends to fluctuate more than Gore’s. If you want a chance at drafting both players, the percentages say to draft Gore first, and there is a decent chance that Wilson might still fall to you. Question: What is the ADP Draft Day Sleepers Tool? The ADP Draft Day Sleepers highlights the top bargains for your league optimization settings by comparing differences in ADP to John Paulsen’s award-winning rankings. Try the ADP Draft Day Sleepers Tool now!! Watch as 4for4 expert TJ Hernandez teaches you how to use the ADP Draft Day Sleepers Tool. You can also read more about the tool below. With 4for4’s ability to optimize player values based on league structure, users can get a customized value for every player no matter the league size, roster makeup, or scoring system in the form of a Bargain Score. The Bargain Score subtracts a player’s 4for4 rank from their ADP rank -- the higher the Bargain Score, the better the value. This is especially useful compared to simply referencing a list of static rankings which may cause owners to make suboptimal decisions if those rankings are used in drafts across various types of leagues. It should be noted that the highest bargain scores will often be close to undraftable because the consensus is so low on them. In these cases, users can target these players towards the very end of a draft or consider them for early season waiver pick ups. Sleepers are not going to be the same across all of your leagues, and the ADP Draft Day Sleepers Tool will pinpoint which players are values in your various leagues. Assume you are looking for late-round running back targets in two different 12-team leagues -- one league implements standard scoring and starts two running backs and two wide receivers, while the other league uses PPR scoring and starts two running backs, three wide receivers and a flex. In the standard league, LeGarrette Blount has an ADP of 118, but is ranked by 4for4 as the 30th running back and 62nd player overall, giving Blount a Bargain Score of +56, the best value of any running back that is likely to be drafted. Optimized for PPR leagues with an expanded roster, the Draft Day Sleepers Tool recognizes Theo Riddick as the best running back value that is likely to get drafted, ranked as the 30th running back and 60th overall, against an ADP of 159 for a Bargain Score of +99. Uses for the ADP Draft Day Sleepers tool go far beyond this specific example, but the ability to optimize values for any league type or roster size is a feature that is invaluable to research leading up to your fantasy football drafts. Question: What are the Draft Day Do's and Don'ts? Draft Day Do’s and Don’ts integrates 4for4’s award-winning projections to produce a list of guidelines for each round of your fantasy draft. Try the Draft Day Do’s and Don’ts Tool now!! Watch as 4for4 expert TJ Hernandez teaches you how to use the Draft Day Do’s and Don’ts Too;. You can also read more about the tool below. By optimizing to your league settings, the Do’s and Don’ts Tool recognizes how valuable each player is relative to the entire player pool and highlights when certain players are values and when they might be reaches. Rather than simply comparing rankings to ADP, the Do’s and Don’ts Tool generates unbiased thresholds for when players should be drafted based on their relative value. The point of the Draft Day Do’s and Don’ts tool is to offer a tangible set of rules that can’t be found with even the best cheat sheets. Imagine that you have a top 200 cheat sheet, but you have two drafts on the same day -- one league rosters two RBs, two WRs and no flex, while the other league rosters two RBs, three WRs, and a RB/WR Flex. A rankings sheet might tell you who will score the most points, but not how valuable a player is given your different roster settings. The Do’s and Don’ts tool does just that, and it changes dynamically throughout the offseason based on changes in player projections. Since the do’s and don’ts are ordered by round, they are an easy reference throughout your draft. If you are someone that loads up on mock drafts throughout the offseason, you’ll surely start to come across the same players in seemingly every mock that you aren’t sure if you should be taking at their ADP or not. The Draft Day Do’s and Don’ts tool will eliminate those questions and have you prepared for all of your drafts. Question: What is the Defense KnowldegeSeeker? The Defense KnowledgeSeeker tracks every offensive stat against all defenses over their last five games. This report can help determine if a team defense is trending up or down against either the pass or the rush. Try the Defense KnowledgeSeeker now! Watch as 4for4 expert TJ Hernandez teaches you how to use the Defense KnowledgeSeeker. You can also read more about the Defense KnowledgeSeeker below. A snapshot of every player’s contribution against each defense can be especially helpful when it comes to roster decisions such as if a team defense might be worth streaming or if a defense is particularly strong or weak against a specific team’s player, such as their WR2. By looking at the previous five weeks of data, there is enough of a sample size that 4for4 users can confidently assess if a defense really performs well in a specific area, or if there has been some short term variance. This information can have both season long and DFS implications. Owners that are considering a certain start/sit might reference the Defense KnowledgeSeeker to determine if a player such as a team's WR2 matches up well against a particular defense, while DFS players might recognize a particular matchup that points to a player that is mispriced on a particular DFS site. Going into Week 17 of the 2015 season, the Carolina Panthers were facing the Tampa Bay Buccaneers and playing for the number 1 seed in the NFC. Ted Ginn had been declared inactive, and although the Bucs defense ranked outside the top 20 against WRs, it wasn’t clear which Panthers receiver to target. Looking at the Defense KnowledgeSeeker, 4for4 users might have noticed that Tampa Bay had given up 15+ PPR points to multiple receivers in three of their last 5 games. With Devin Funchess, Corey Brown, and Jerricho Cotchery all priced at $3400 or lower on DraftKings, DFS owners could afford to take a shot at any of the three or even a combo of two of them and still have a realistic shot at a favorable outcomes, since it was clear that the Bucaneers had trouble covering multiple receivers, and weren’t weak in one particular spot. In their final game of the season, Jerricho Cotchery posted 13.2 DK points and Devin Funchess finished in the top 10 among wideouts with 27 DK points. Owners assessing this situation might have taken a stab at one Carolina receiver or even avoided the unclear situation altogether, but users of the Defense KnowledgeSeeker might have capitalized on the situation, possibly even starting two cheap receivers, since they knew that Tampa Bay was capable of giving up big games to multiple pass catchers. Question: What is the Offense KnowledgeSeeker? The Offense KnowledgeSeeker tracks every offensive stat for all teams over their last five games and can help determine if a team is trending up or down in the passing game or on the ground, as well as pinpoint which players have been the biggest contributors at each position over recent weeks. Try the Offense KnowledgeSeeker now!! Watch as 4for4 expert TJ Hernandez teaches you how to use the Offense KnowledgeSeeker. You can also read more about the Offense KnowledgeSeeker below. A snapshot of every player’s contribution to their team can be especially helpful when it comes to roster decisions such as which running back should be targeted in a committee or which receiver is the true number two on a team. By looking at the previous five weeks of data, there is enough of a sample size that 4for4 users can confidently assess if a recent hot streak is an actual trend or if a team or player just had a recent stroke of luck. This information can have both season long and DFS implications. Owners that are considering a trade or waiver wire pick up might reference the Offense KnowledgeSeeker to determine if a player’s recent production has been a product of volume, while DFS players might uncover a player that is underpriced based on their volume that hasn’t yet turned into fantasy points. Consider the 2015 New York Giants backfield. Through 13 weeks, Rashad Jennings and Shane Vereen had shared backfield responsibilities, averaging 12 and nine touches per game, respectively. In Weeks 14-16, though, Jennings averaged 19 touches per game, compared to under six per for Vereen. Because Jennings hadn’t broken 15 PPR fantasy points in any of those games and was actually outscored by Vereen in Week 15, few fantasy owners had taken notice. Going into the final week of the season, New York was facing a Philadelphia defense that ranked 30th in 4for4 Schedule Adjusted Fantasy Points Allowed to running backs and Jennings was priced at just $3700 on DraftKings, 34th at his position. Users of the 4for4 Offense KnowldegeSeeker likely noticed Jennings recent uptick in usage as well as Vereen’s waning touches and took a flyer on Jennings, given his affordable price tag. Rashad Jennings went on to score 28.6 DK points and lead all back in scoring in Week 17, likely resulting in many profitable lineups for anyone that rostered him. This is just one example of how powerful the Offense KnowledgeSeeker can be in making roster decisions throughout the season, but like many of the tools and reports at 4for4 Fantasy Football, the applications go far beyond this example and extend to all positions. Question: What are Box Score Forecasts? The Box Score Forecasts take team and player projections and provide a snapshot for how every offense is expected to perform and where that production will come from. Try the Team Box Score Forecasts now!! Watch as 4for4 expert TJ Hernandez teaches you how to use the Box Score Forecasts. You can also read more about the Box Score Forecasts below. By showing exactly where every yard and point is most likely to come from for each team, the Box Score Forecasts allow users to decide which players to target on offenses with great matchups, and more importantly, if multiple players from one team have fantasy value. For season long leagues, applying this concept is especially helpful when owners are stuck in a start/sit conundrum because starting two or more players from the same team can sometimes lead to cannibalization of each other's points. Because the Box Score Forecasts show not only the projected stats, but projected fantasy ranks for that week, users can quickly get an idea if it’s feasible to start multiple players in the same offense. Projections in the Box Score Forecasts are invaluable for DFS purposes, specifically when users are looking for teams to stack in a given week. Though the uses in DFS can be similar to the start/sit application in season long leagues, the precise projections in the Box Score Forecasts offer an opportunity to leverage ownership percentages in DFS, which are very important to take note of when playing large field tournaments. Assume Jacksonville has a great matchup in the passing game and you are trying to decide which pass catcher to pair with Blake Bortles in a tournament. The Box Score Forecasts have Allen Robinson projected for 0.7 touchdowns, while Allen Hurns is projected for 0.5 touchdowns. In other words, Robinson has about a 70% chance to score, while Hurns’ chances sit at about 50% to find the end zone. After the Thursday night games, we know that Allen Robinson is owned in about 35% of contests while Hurns is owned in just 5%. With a 20% gap in chance to score, but a 30% gap in ownership percentage, the optimal DFS play might be Hurns over Robinson. Question: What is the Target Report? The 4for4 Fantasy Football Target Report highlights targets for all position players from the previous two weeks. Try out the Target Report now!! Watch as 4for4 expert TJ Hernandez teaches you how to use the Target Report. You can also read more about the Target Report below. This report can serve as one of the best indicators for possible breakout candidates throughout the season. Players that are heavily targeted in their team’s passing game but haven’t been scoring many fantasy points are often undervalued assets based on their given opportunity. Because other fantasy owners tend to focus on recent fantasy production rather than actual opportunity, the Target Report can assist owners in finding sneaky starts, cheap waiver wire pickups, buy low trade candidates, or players that are underpriced on DFS sites. By looking at the last two weeks, rather than just the previous week, the Target Report can spot trends before they are obvious to other fantasy owners, but also breaks down whether a player is actually trending up or if they just had one game of heavy usage. Imagine over the last two weeks, two players have 15 targets each. One player posted consecutive games of 12 targets and three targets, while the other player saw consecutive games of eight targets and seven targets. The former player may have had one fluky high volume week, while the latter might be trending toward a steady workload. The Target Report also accounts for percent of team targets, which helps puts a player's workload into context. Two players with 10 targets each in the same week are not necessarily the same. If one player’s team threw 50 times, while the other’s threw just 30, the player on the high volume team likely won’t increase his production, and might even see his production wane if his team’s passing volume decreases. On the other hand, the player that accounted for 30% of his team’s targets might be in line for a huge game if and when his team faces a weak passing defense or ends up in a shoot out. This is just one of the many tools that can be referenced weekly at 4for4 Fantasy Football that assist fantasy owners in gaining an edge over their competition. To gain access to this and many other award winning fantasy football tools and rankings…. Question: What is the Player Snap App? The Player Snap App is a customizable search engine that displays snap and fantasy scoring efficiency data for a specified number of weeks for all teams and skill positions. Try the Player Snap App now!! Watch as 4for4 expert TJ Hernandez teaches you how to use the Player Snap App. You can also read more about the Snap App below. By highlighting snap totals over a specific time frame and listing snap percentages for each week, the Player Snap App helps spot trends based on increased or decreased fantasy opportunity. If a player is expected to see increased playing time or their playing time has been trending upward, the Fantasy Point per snap data highlights whether or not that player has been an efficient fantasy scorer when they have been given opportunities. While many fantasy football owners tend to focus on fantasy points scored, users of the Player Snap App can recognize real trends and decipher whether or not a player has been lucky of late or has real long term value. Going into Week 15 of the 2015 season, two running backs, James Starks and David Johnson, were seemingly both great starting options in the fantasy playoffs. Starks had scored double digit fantasy points in five of his previous six games, while David Johnson was coming of of consecutive 17+ point games. In fact, the two running backs had compiled an identical 37.3 PPR fantasy points over the last two weeks and had similarly favorable matchups going into Week 15. Looking at the Player Snap App though, users would have noticed that David Johnson had played 75% of his team’s snaps during his two week hot streak, while Starks had played just 43% of Green Bay’s snaps over the last four weeks with no more than 49% of the snaps in any single game. Johnson went on to score 44.9 PPR points in Week 15 and 66.6 points over the last two weeks of the fantasy playoffs, while Starks failed to break double digit points in any of the Packers’ final three games. With similar applications to any skill position and access to fantasy points per snap data, the Player Snap App goes far beyond this single example, but this instance highlights how powerful the app can be in turning research into fantasy wins. Question: What is the Fantasy Points Browser? The Fantasy Points Browser allows users to find and compare fantasy scoring data for all major scoring systems for all positions over a specific time range within any season, going back to 2013. Try the Fantasy Points Browser now!! Watch as 4for4 expert TJ Hernandez teaches you how to use the Fantasy Points Browser. You can also read more about the Fantasy Points Browser below. The Fantasy Points Browser is able to filter for each team, position, and week and displays the fantasy points for each of the last four weeks of the selected range as well as the total fantasy points and fantasy points per game average for that time range. This tool is especially useful for looking up fantasy scoring data for a range of non-consecutive weeks, data that can often only be found through manual calculations. Usually when looking up fantasy points, fantasy football owners often find two reports: last week’s points, and cumulative points for an entire season. For a lot of research, both leading up to fantasy drafts and in-season, these reports do not suffice. Some of the best nuggets of information come from looking at how players performed over a specific time period or over individual, sometimes non-consecutive, weeks. In 2015, Alshon Jeffery finished as the WR42 in terms of PPR leagues, but he only played nine, non-consecutive games. If you want to know exactly how many fantasy points Alshon scored compared to the rest of the league only for the weeks in which he was active, the Fantasy Points Browser allows you to select only those weeks (1, 6, 8-10, 12-15) and see scoring data for every receiver in the league for those games. When active, Jefferey actually ranked seventh among all wideouts in PPR leagues. When making crucial decisions, such has how to tier your players going into your fantasy draft, going beyond total fantasy points scored or fantasy points per game can give owners a league winning advantage. Uses for the Fantasy Points Browser go far beyond this specific example, but the ability to manipulate specific time frames for fantasy research should be embraced by anyone that is looking to take their fantasy football game to the next level. Question: What are 4for4 Hot Spots? The Hot Spots Tool takes Schedule Adjusted Fantasy Points Allowed (aFPA) and provides strength of schedule analysis for every team against every position at a glance. Watch as 4for4 expert TJ Hernandez teaches you how to use Hot Spots. You can also read more about Hot Spots below. By color coding strong and weak defenses, users can get a quick understanding of a team’s upcoming matchups in the near future or over the course of an entire season. Unlike the aFPA page, where we usually just want to see one specific matchup, Team Level Hot Spots gives us a glimpse into the future, which is especially helpful for analyzing draft picks, trades, or waiver wire pickups. Outside of specific week matchups, Hot Spots also gives average SOS for two and three week playoff structures and the rest of the season (ROS), stats that especially useful for teams fighting for a playoff spot in their league or dealing at the trade deadline. With links to each position for both standard and PPR scoring, users can quickly jump to their position of interest for their specific scoring system. Player Level Hot Spots is presented and works exactly like Team Level Hot Spots but lists individual players rather than the team. Users that have a specific player in mind to evaluate for a trade or waiver pickup might gravitate to the Player Level Hot Spots over the Team Level, though the two can be used virtually interchangeably. The Team Offense Hot Spots report is especially worth noting on its own. This report gives a broad look at a team’s overall offensive matchups. If a fantasy owners is considering starting multiple players from one offense or making a trade that includes a bundle from the same team, this report serves as a valuable tool to see if a specific offense will face teams that are generally bad all around on defense. For DFS purposes, this broad perspective on matchups can serve as a decision point if you are considering stacking two or more players from the same team, especially if you are pondering a non- traditional correlation play, such as a RB and WR. Team Defense Hot Spots serves as an essential tool when deciding which DST you might roster on either draft day or as a waiver wire pick up mid-season. Owners who plan on streaming DST will find this tool very useful for quickly identifying poor offenses that surrender a lot of fantasy points to opposing DST. For those in very deep leagues, this tool is especially useful for pinpointing a DST that you can roster for multiple weeks at a time, or beating the rest of your league to the punch on a DST that has a favorable matchup in the upcoming weeks. Question: What is Schedule Adjusted Fantasy Points Allowed? Schedule Adjusted Fantasy Points Allowed (aFPA) adjusts raw fantasy points allowed for each individual team's strength of schedule. Try Schedule Adjusted Fantasy Points Allowed now!! Watch as 4for4 expert TJ Hernandez teaches you how to use aFPA. You can also read more about aFPA below. aFPA is the backbone of 4for4 Fantasy Football’s Strength of Schedule analysis across the entire site and compares fantasy points allowed data on a more accurate scale than raw fantasy points allowed, by adjusting for each team’s individual strength of schedule. aFPA uses rolling 10 week data, which offers a large enough sample size to be accurate, but also keeps the most relevant data. aFPA feeds into other 4for4 tools, such as the Hot Spots, and is noted most commonly under the M/U (matchup) columns in various reports such as weekly rankings and DFS Value Reports. To understand how aFPA works take two teams from 2015, the Dallas Cowboys and the Kansas City Chiefs. After Week 15, Dallas and KC ranked first and second, respectively, in aFPA versus opposing quarterbacks. In the 10 weeks leading up to Week 16, Dallas had allowed just 11.6 raw fantasy points per game to opposing quarterbacks, while KC had given up 14.3, but raw fantasy points allowed doesn’t remove schedule bias. The Schedule Adjusted Fantasy Points allowed metric recognized that in that 10 week period, the group of QBs that Dallas faced averaged 14.4 FP/g, while KC played against QBs that posted 19.1 FP/g. The Chiefs’ ability to hold that group of signal callers to just over 14 points FP/g is clearly an impressive feat, and aFPA rewarded KC with a high ranking. Without the use of aFPA, a fantasy owner might have seen the raw data and figured that the Cowboys were an obvious team to avoid with their QB while KC might be worth targeting. This example highlights the importance of using aFPA, especially for weekly matchup decisions, but its use extends to every position for every single team, for both standard and PPR scoring.